Play’n Go is an iGaming company that’s responsible for the creation of many slot games. They are so good that they are among the most popular to date. One of the games is Cops ‘N Robbers. Thе game follows closely the theme of the continual war waged between the police officers and the burglars of the world. If you’re a fan of this theme, then the chances are that you will enjoy Cops ‘N Robbers. It has a bit of a retro feel, though. It’s much more similar to the old slots of the turn of the millennium than to the modern versions. So, if you’re fond of the retro style, be sure to check it out. There are 9 pay lines, in total. The title features 5 reels with the spinning symbols. There are a couple of unique features that you can read more about below. If you want to take no chances at all, then you can use the minimum bet. And here, the minimum bet is very low. The lowest bet is 0.01 coin on 1 pay line. The maximum bet is a bit bigger than this – you can bet 90 coins in total if you play Cops ‘N Robbers for real money. There are two special symbols, too. The first one is a wild symbol – in the form of a safe. The wild symbol takes the form of any other symbol you may need in order to win – the Scatter symbol being the exception to this. Also, a unique feature is that the wild symbol doubles the winnings that you will make. Then comes the special symbol in the form of the Scatter. It’s a police car – if you get three or more of them, then you will activate the bonus with the car chase. This is exactly where the strongest feature of this online casino slot is to be found. The bonus is very fun to play through. You will get a number of free spins – up to 25. During these free spins, you will see a police car chasing you in the rear view of your own car. Get away – and you will get your winnings doubled. If you want to make the big money while you play Cops ‘N Robbers slot machine online, then you can use the gamble feature. Every time you make a win – you can choose to collect it or to gamble it. The goal in the gamble is to guess the colour of the suit of the card. You can choose either black or red. If the colour is the one you have chosen, then you double your winnings. You can have another go and win big money in this way. But there’s also the risk to lose all your wins from the winning go. Also, you can use the autoplay feature in Cops ‘N Robbers. Pick freely the number of automatic spins that you would like the game to perform for you. And then it practically plays itself out. It’s a useful feature if you have something important to do – but you don’t wish to stop playing. The RTP rate of this casino machine is 95.02%. This is JUST above the regular 95% RTP rate that’s to be found in internet gambling. So, this doesn’t really make Cops ‘N Robbers slot all that attractive when it comes to the RTP rate. 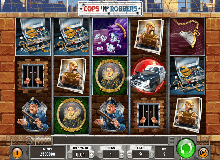 The old-school style of Cops ‘N Robbers casino slot online can seem outdated to some of you. Moreover, the small number of pay lines will detract many players. 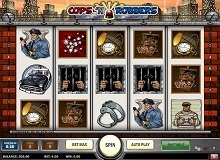 But in all cases, you can play Cops ‘N Robbers slot machine online for free. 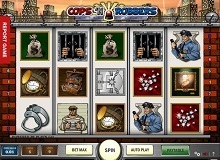 You can find Cops ‘N Robbers free versions at some online casinos. 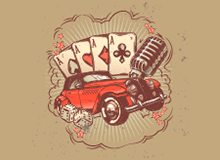 Be sure to check the free spins feature – this is where the main strength of this casino slot lies.